This charming little rug with its beautiful light-green outer and inner borders, was possibly made by the Bolvardi taifeh of the Qashqa'i Confederacy circa 1890. The rug is in lovely condition with beautiful soft, glossy wool and a depiction of various animal life throughout the central field. Size: 1.27m x 0.81m (4' 2" x 2' 8"). 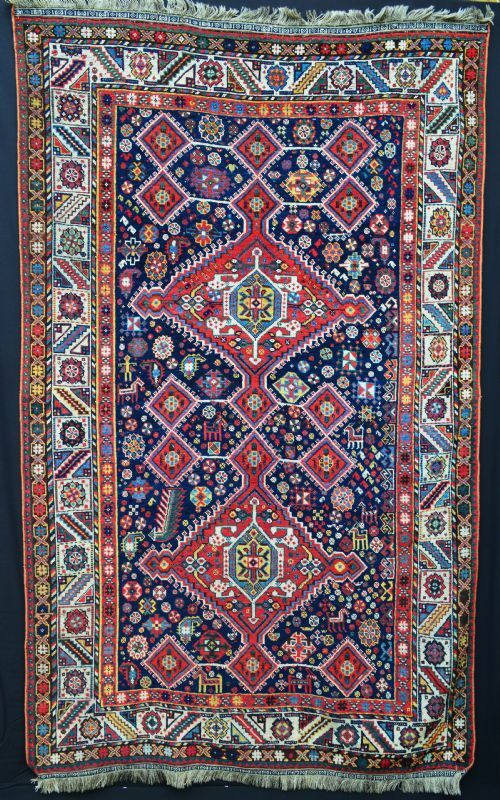 The Kashkuli nomads were the finest weavers within the Qashqa'i Confederacy and this rug, made circa 1880, is a testament to the exceptional quality of these 19th century Kashkuli rugs. The beautiful indigo-blue field contains a myriad of flowers which, to these nomads, represented their woven gardens within their black tents. The main border is finely executed and the saturated natural colours are glowing in the very best way. Just magnificent! Size: 2.31m x 1.27m (7' 7" x 4' 2"). This is a truly beautiful example of the best of Shekarlu - Qashqa'i weaving. It is important to look at the detail images to really appreciate the wonderful vegetable colours. 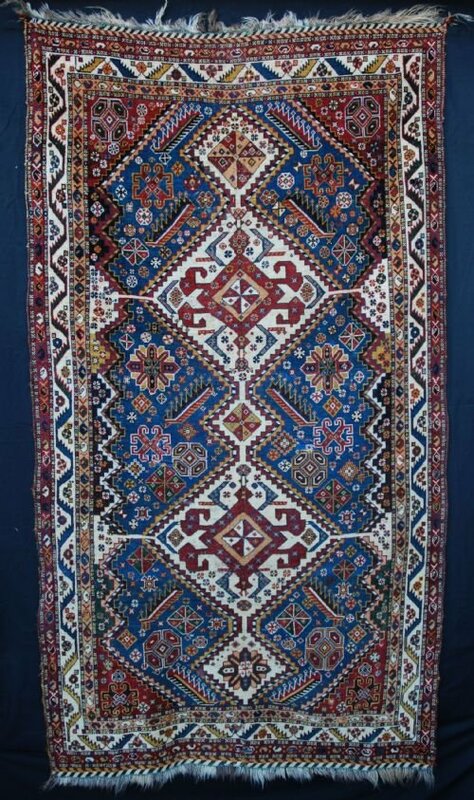 Made around 1870, the rug is in very good pile albeit the selvedges have been replaced due to wear. The main ivory border is typical 'Shekarlu' as is the indigo-blue field with its stylised trees and flowers - a true garden of Paradise! Size: 2.16m x 1.70m (7' 1" x 5' 7"). 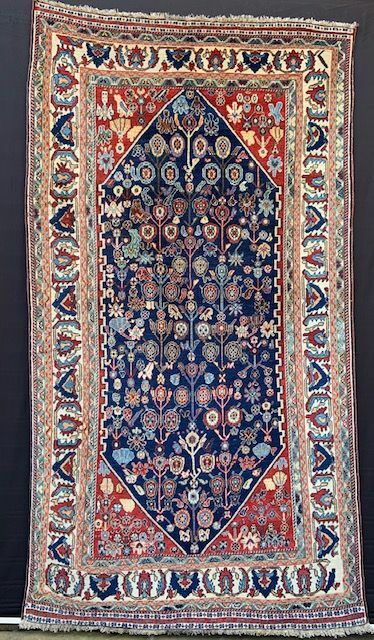 This beautiful Qashqa'i rug, made circa 1870, has a myriad of creatures of all kinds depicted in the indigo-blue field. Look to the lower left of the top large lozenge and you will see a horse and rider and then just cast your eye over the entire field - which might take several hours, even months - and you will find many interesting animals and symbols! 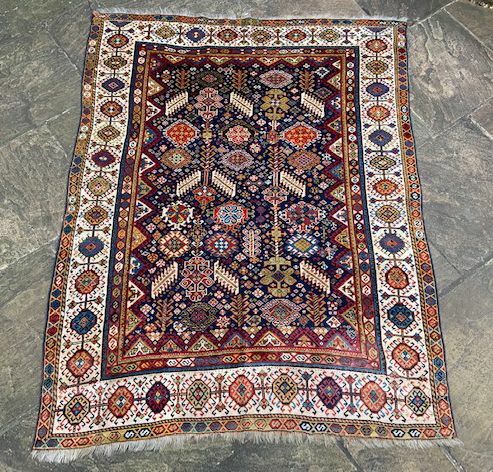 All dyes are vegetable and the rug is in good condition, albeit evenly low pile all over, but not worn. The ivory border is a powerful frame to a magical rug. Size: 2.40m x 1.45m (7' 10" x 4' 9"). 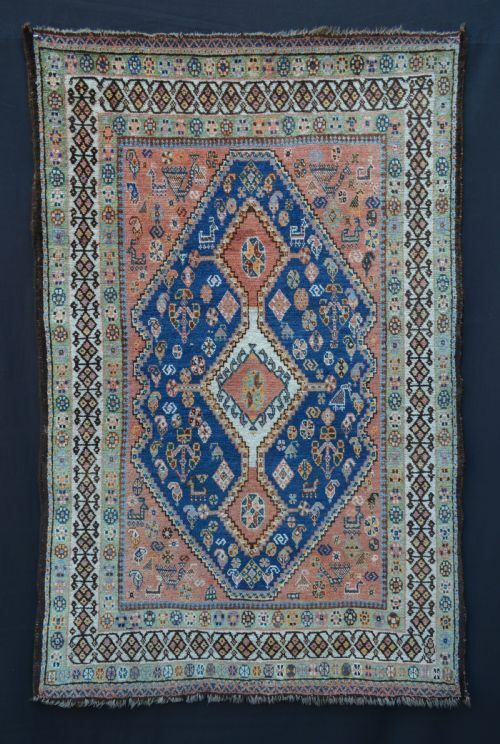 This unusual and finely knotted little Qashqa'i rug was probably made by Kashkuli weavers - the finest rug-makers within the Qashqa'i Confederacy -during the second half of the 19th century. The colours are all vegetable and the rug is in excellent condition. Size: 1.26m x 0.99m (4' 2" x 3' 3"). 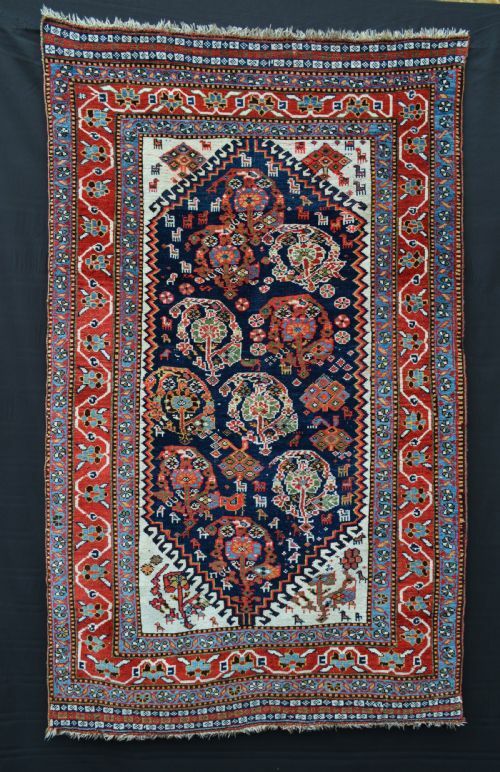 A truly gorgeous little rug of the Shesh Boluki taifeh of the Qashqa'i Confederacy, made circa 1890-1900. 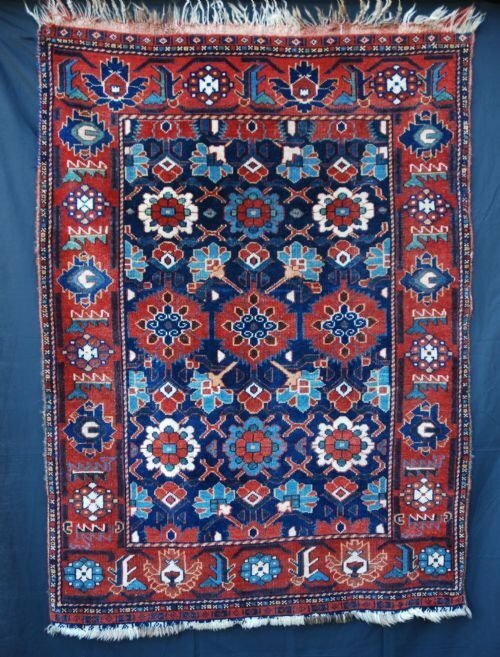 The rug, all vegetable dyes and in excellent condition, contains large curvilinear botehs in the indigo-blue field and surrounded by a myriad of birds and animals, including one solitary fat chicken! The wool is soft and shiny and the rug retains its original piled skirts at each end. Size: 1.78m x 1.09m (5' 10" x 3' 7"). 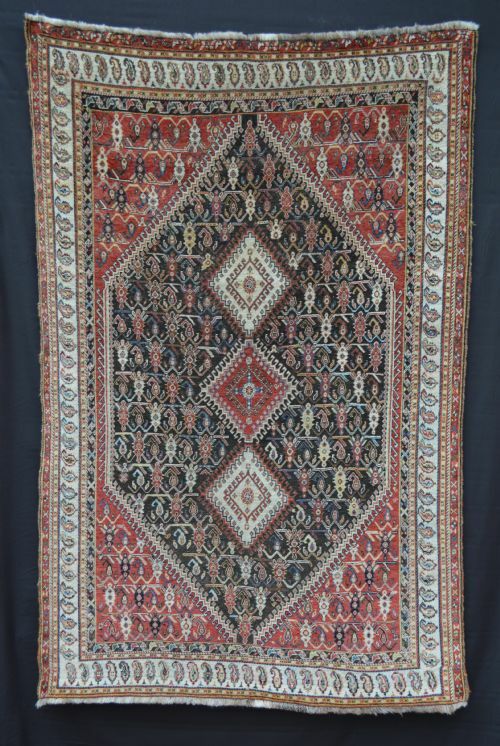 A rare and quite unique Qashqa'i rug in the style of the designs used by Baluch nomads in the Ferdows region of south-eastern Persia. The rug, of course, is undoubtedly Qashqa'i and I would hazard a guess that it was made by the Shekarlu tribe within that confederacy. It is in very good condition but with some minor wear in places. It was made circa 1880, with stunning, saturated vegetable colour throughout. Size: 1.52m x 1.12m (5' 0" x 3' 8"). 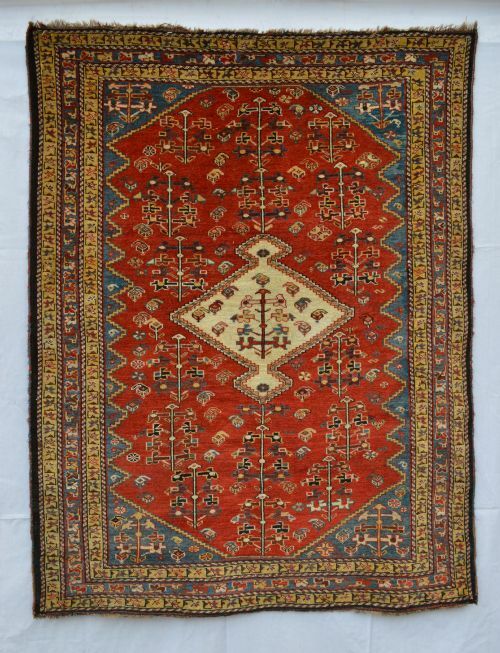 This beautiful 19th century Qashqa'i-Kashkuli rug was acquired recently from an old English country house. It's a beautiful piece with evenly low pile but with several holes and poor old re-weaves throughout which will require about £500 spent on it. I have had the rug professionally washed and the price reflects its current state. The wonderful old natural colours are stunning. Size: 2.14m x 1.22m (7' 0" x 4' 0"). Gabbehs were reasonably coarsely knotted for the purpose of using as everyday floor rugs in the black tent and also for wrapping-up children during the long, cold winter nights. Today, gabbehs are relatively rare due to the fact that they were worn out quickly and discarded and because they are no longer made in the ancient traditional way. 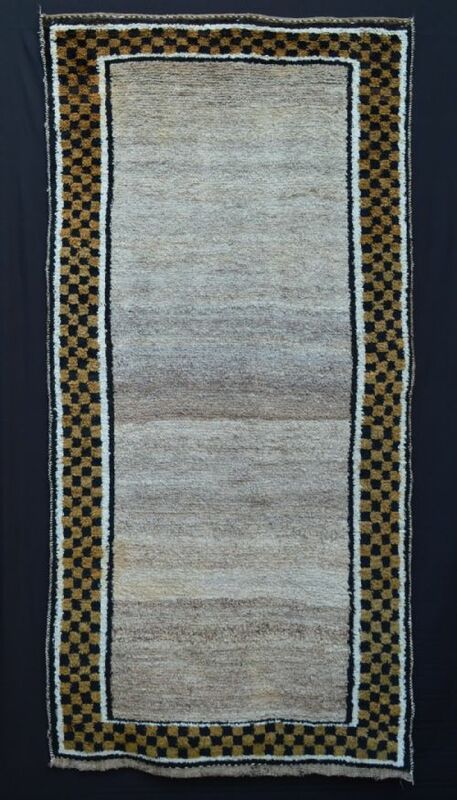 All gabbehs had simple designs - some coloured - some made in un-dyed wool such as this one, referred to as 'shooli' gabbehs. 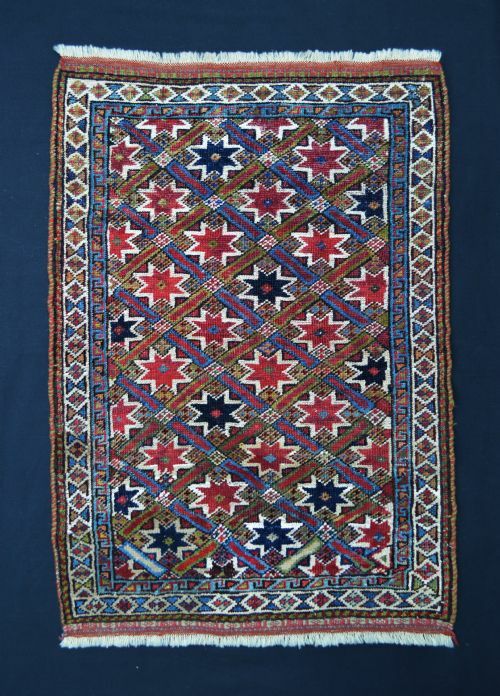 This gabbeh, made by Qashqa'i nomads around 1900, is in excellent condition. Size: 2.21m x 1.07m (7' 3" x 3' 6"). 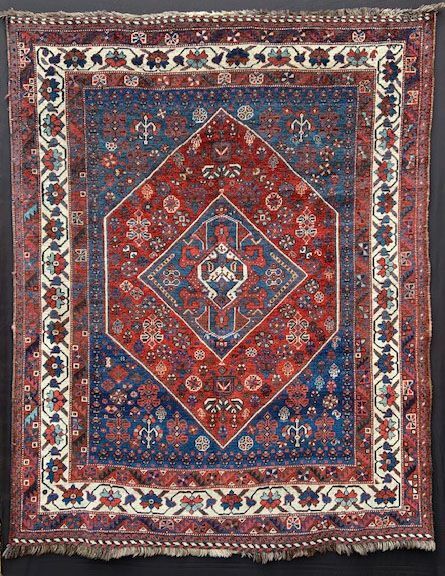 Small Poshtis (mats) made by the Qashqa'i are uncommon and this charming little poshti has a myriad of '8-pointed' stars throughout the central field, disappearing under the borders and into infinity. The '8-pointed' star symbolises protection and in Persian, is referred to as 'gezel geichi'. This little poshti is in good overall condition albeit the pile is evenly low, and was made at the end of the 19th century. 76cm x 54cm (2' 6" x 1' 9").